President Trump has announced the USA’s new missile defence policy, which leads us closer to the militarisation of space. The new Missile Defence Review details the development of new technologies, including a space-based layer of sensors as part of an enhanced missile defence system. Specifically referring to America’s perception of threats from China and Russia, Trump’s new policy calls for major upgrades to a pre-existing land and sea-based interceptor system, as well as a layer of satellites capable of tracking new cruise or hypersonic missiles from other nations. In a clear escalation of missile policy, President Trump said that the US will now use an enhanced missile system as a part of America’s “defense and obviously part of our offense” – confirming what CND and critics have long known: the US missile ‘defence’ system is actually a highly offensive system which threatens global stability. In creating a system which is devised to “detect and destroy any missile launched against the United States – anywhere, anytime, anyplace”, the US plan for a revised missile defence system has already alarmed arms control experts around the globe. Trump’s missile defence will undoubtedly escalate hostilities between the US, China and Russia due to the threat of their own systems being rendered obsolete. The result of this insecurity is very likely to be an escalation of the arms race as these nations seek to develop new weapons capable of addressing Trump’s space technology. Combined with Trump’s reckless intention to withdraw from the INF treaty on February 2nd, this new missile policy is eroding an increasingly weakening international arms control system, making the world a more dangerous place. 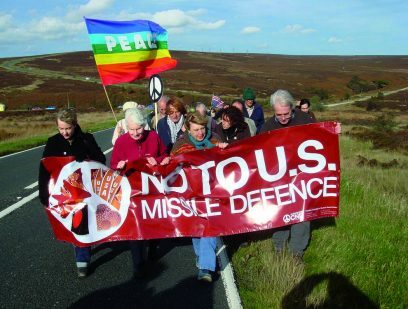 Parts of the US missile defence system are based in the UK, on RAF bases, which CND has long opposed. We must confront such reckless policies, and call on the UK government to refuse to co-operate with Trump’s arms race.